The main design element for Veranda Conservatories features an extended roof-line (canopy) over one or more sides of the room that creates a sheltered or covered area that has protection from the elements, giving shade on sunny days or a dry seating area during wet weather. Sometimes the area under the overhang can be raised decking or something simple like patio slabs or gravel – a nice place to set a table & chairs to relax. For lean-to designs a veranda option is normally fitted to the longer side and in general is used over the side that has the doors. The roof sections can be made out of glass or poly-carbonate (as can the whole roof). The poly-carbonate material has the advantage of being lighter and less expensive and can be found in 3 or 4 different colours. Overhanging fully glazed sections can be heavy, so it’s prudent to ensure that the supporting roofing bars are structurally strong enough to support the weight. Veranda extensions can work well with most conservatory designs, especially lean-to or those with a straight front or side - but it might be a bit difficult to add one to the bays of a Victorian Conservatory. The Veranda or Canopy section can be fitted either between the same length or different length walls, have one wall and a glazed side or both sides glazed. 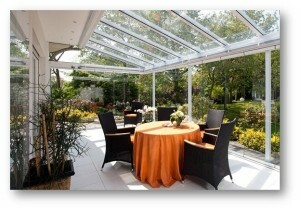 Add a Veranda Conservatory to Your Home. Compare prices for your new extension here.